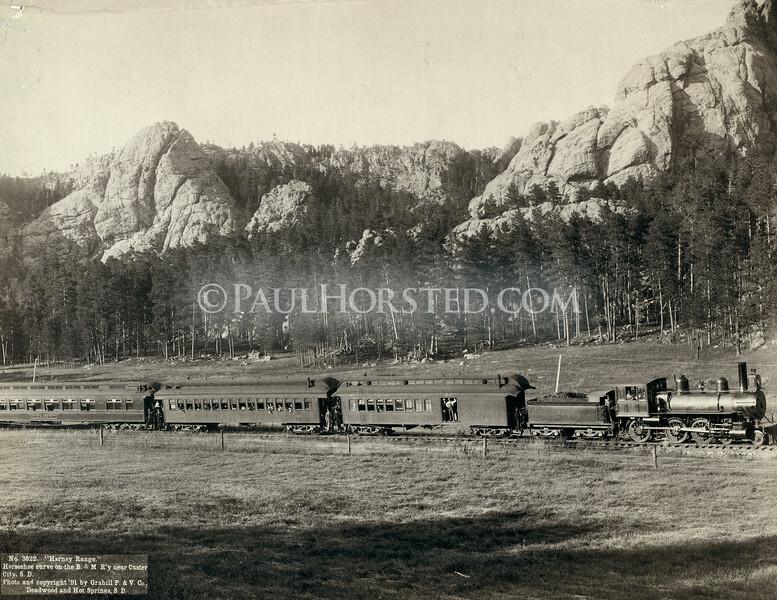 “Harney Range, Horseshoe Curve on the B&M R’y near Custer City, S.D.”.. These mountains may be part of the “Harney Range,” technically speaking, but the mountain itself is six miles away. In another of his images, photographer Grabill identified a rock a mile up the valley as “Harney Peak,” so perhaps he was confused about the geography here. At first glance there isn’t much here to tie this scene to the 1912 image, except a much larger Open Cut that has been dug to a depth of 800 feet. Closer examination reveals one surviving building: the light-colored structure at far right, which was built as an electrical substation in 1911. The rest of this part of town has disappeared over the years as the mine expanded.